Competition and the urge to do better than the rest is the most common and the most observed mindset in the corporate world where every other person leaves no stones unturned to reach his milestone and make his recognition possible. Whether it is about artistry or the design designation; every worker loves to make his/her co-workers dance and sing hymns of his work. The most effective way to get across the masses is to endorse, advertise and make it familiar with the rest of the people so it finally becomes a reality. Advertisements play a good role to give a reasonable weigh to the brand/product. It makes a quick assimilation and connection between people and the owners. Through print media, electronic media, outdoor billboards, brochures and flyers a good connection and intimation can be built up easily. The basic stance is to educate people, aware them and indicate them to incline towards the product. However advertisements can be done differently depending on the demand, budget and requirement of the brand owners. I have been designing billboard mockups lately and this has let me know that the mockups became so helpful for you all. 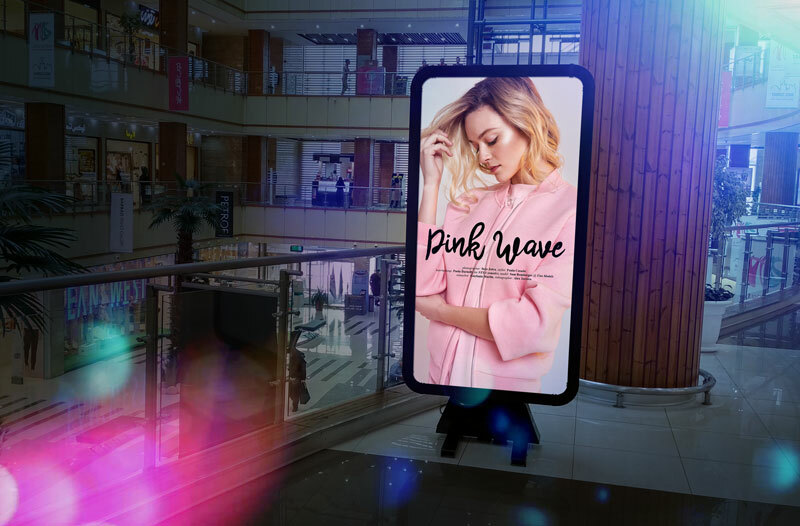 Down here you will see a free Instore advertising billboard mockup PSD that can be freely used in personal and commercial projects to depict the brand or its product inside a mall, shop, market or inside a store. It will drive people towards it, usually there is a built-in light (blinking) inside the billboard so to attract people towards it as much as it’s possible, the passerby stops to glares at the advertisement and hence gets himself familiarize with the product or brand. This is a lot simpler and easier than any other possible in store advertisements. For some technical and interesting design feed, stay tuned to the blog, we are here to put forward the amazing collection of design for you all. Your feedback is always so overwhelming and we cannot thank you enough for this. Here we go to come again next time with something inspiring as well as helpful for you.